We've got our "Sweet Sixteen" career experts (a strong squad of resume writers and career coaches), and now we're actively recruiting voices from the other team--the recruiters. We'lll keep you posted as the list expands. Meanwhile,why not try a #mcm Twitter Search and post your favorite Tweet of advice below? Is your job search is becoming a twisted version of the NCAA "big dance"? Do you find yourself applying to 64 opportunities before making it to the "final four" candidates for a position? 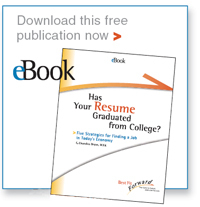 In the process of beginning a sudden job search? Feeling stuck? Need to get "back in the game" with your career? Don’t despair…the time has come for a new kind of office pool. This event, which will run throughout the month of March, is a joint effort of a team of career experts who have committed to sharing their wit and wisdom with us in “tweets” of 140 characters or less on Twitter. Posts will be written on a singular theme--innovative strategies for your career. You can follow March Career Madness through Twitter Search (search #mcm) or by following the tweets of individual contributors (name and user “handles” listed at the bottom of this post). Share posts with others by “Retweeting." If you’ve been meaning to try Twitter, this is a great time to start—and a safe place for watching experienced users interact and share knowledge before you dive in as an active user. A word of caution: Keep in mind that Twitter is a searchable public forum, and don’t share any information you don’t feel comfortable having passed on. As with Facebook, employers have been known to monitor “how they’re talked about” and how current and potential employees represent themselves online. We encourage you to watch—and participate in—March Career Madness. Here are three resources to help you getting started. Social media expert Chris Brogan’s straight talk on how to get started. This list will expand as additional career experts join us. Join us, and find a new play or two that helps you make a "three-pointer" in your career!